I started out weaving this with a two-ply handspun, churro and Icelandic. But the sett is too close with this reed, and the weft did not show through enough and I didn’t like the result, so I tried the churro singles. It was still on my spindle, and I discovered that this particular spindle (from Allen Berry) is of a length and whorl shape that works perfectly as a shuttle. Convenient! And I like the look of this weft, so I just kept weaving with the spindle as shuttle. Allen, who also carved the beautiful yellow cedar sword/beater, mentioned that he’d heard of people using spindles as bobbins/shuttles before, and this rang a faint bell for me, too. I knew I’d definitely seen people winding a warp directly from full spindles, and I found the video: winding a warp directly from spindles, in Western Ladakh. It does sound familiar, though, putting a spindle into a shuttle as bobbin…. maybe a quill spindle, for cotton…? I can’t remember where I saw or heard of that, but pipe up if you know anything. At any rate, I’m enjoying having a plain weave project with the reed on the loom again, and this time I’ve wound the far end, so I can weave a longer length without dealing with the full weight of a 3+ yard warp between me and the loom bar. Seems to be going ok. I have tension issues, but what else is new? The lovely Navajo Churro fiber I’m spinning. It was a gift from Amelia, who got it from someone else, so I can’t say much about the provenance. This (beautiful Peruvian) spindle does not work as a shuttle, so I have to wind it onto a bobbin, but using it allowed me to spin while weaving with the other spindle. Otherwise, I’m working on the opposite end of the spectrum from plain weave - trying to wrap my mind around a pattern and technique that have been calling to me for years. It’s the typical Central Asian yurt band weaving, which Laverne has graciously explained in various tutorials, under the name of “simple warp floats” (simple because they float on one side only, the top.) I’ve had those pages, and this one, bookmarked and screen-shotted, and photos copied and printed since she started posting about it back in 2010. For some reason, the yurt bands have always grabbed me, and I knew I would have to figure it out someday. 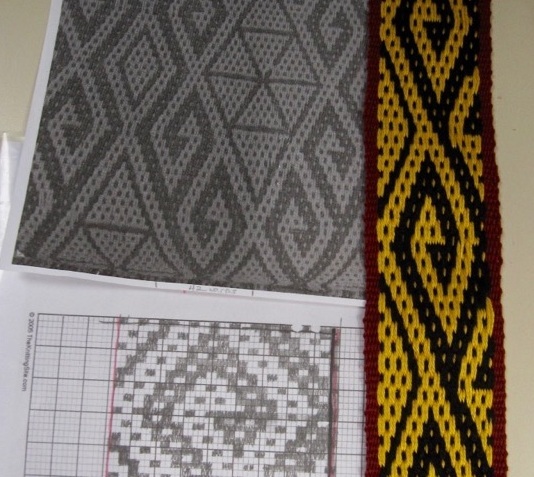 Yes, Laverne has explained it nicely and given plenty of ways for it to make sense - BUT, the actual translation of woven pattern to chart, especially with the Central Asian tendency to stipple the background, is really quite challenging. That final link, where Laverne made a wide piece with pickup in foreground and background, has just always thrilled me. Sample with striped (plain weave) background. Note that in the tutorials, the background remains striped, which is plain weave with no pickup. Doing pickup on the whole surface is another ball game, and a very different one from Andean pebble weave or complementary warp pickup. The designs look similar, especially on the front, but structurally they are a different technique, and the rules for composing patterns are not the same at all. 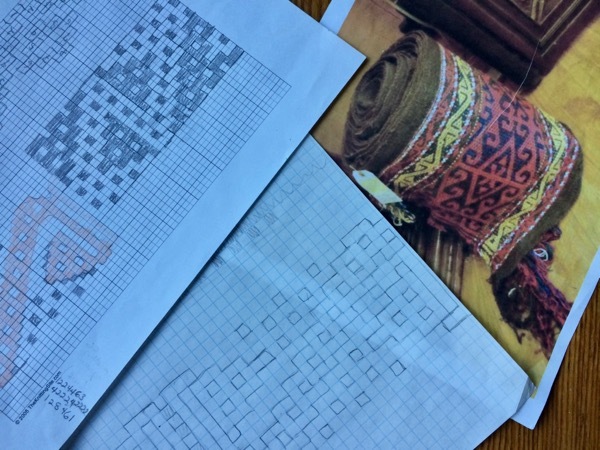 I found out how different, and what some of the rules were, while trying to chart a section of a yurt band pattern, based on a printed photo of an actual band belonging to Marilyn Romatka. Warning: this could hurt your head…. Marilyn Romatka’s yurt band, about 13” wide by 15+ yards long. I was still daunted by the wide yurt band patterns, but I really wanted to figure it out. Recently, circumstances came together that allowed me to sit down, look at Laverne’s images once more, and take on the pattern. I charted a quadrant of a symmetrical design, and started weaving a half-width to test it. So far, it’s working! One repeat of the design. I took out a couple of rows to correct the vertical mirroring point, but now I think that’s figured out. Cascade Ultra Pima cotton yarn - it’s what I had handy. I’m continuing to look at the yurt band photos and trying to understand more of the typical patterning, so that I can create border designs in narrower strips. Spending my morning on this kind of thing is deeply gratifying, in the way that finally being able to weave something one has admired for years can be. The next effort at this will be with handspun wool. Trying to chart border patterns from this image and from Marilyn’s band…. The yarns I have in mind. I didn't know I was going to focus so much on this weaving today, but it just sucked me in. I've been spinning for backstrap weaving for a while now, trying to build up a collection of different colors that are all spindle-spun and suitable for warp. Not a huge range of colors, but enough to choose from to make a bag-sized weaving. I was in the midst of warping this handspun for a striped piece with Andean pickup bands. It needed to be warped in two bouts due to the width of the piece in relation to the size of my warping pegs - that's why I stopped in the middle. So today should have been just finishing up less than half of the warping. But, after doing that, and laying the two bouts side by side on loom bars, the second bit was clearly much tighter, so I did it again: 30 rounds of dark, some stripes, a pickup band of 8 pairs, border, then 20 rounds of green. Much better results. Got it heddled and felt good, apart from noticing a stripe I'd left out - ah well, it wouldn't be my weaving if there weren't something odd in there. When I needed weft yarn, I was able to wind a shuttle from the green at the top of my discarded too-tight second bout. Then I started to consider patterns for the pickup, and was looking at Nilda Callañaupa's book on Textile Traditions of Chinchero. The book includes patterns that have been found in old textiles and reproduced or documented. One was a variation on the cutij/kuti or "hoe" pattern, an 8 pair design I've worked with. The pattern in the book seemed to have the same number of pairs, so I lifted the 8-pair pickup section off the discarded bout of warp to test it out (the discarded bout of warp was coming in very handy!) After a very focused half hour or so, I had a replica of the double-bar kuti pattern, in 8 pairs. At this point I was very proud of myself. My test band on the picture from Nilda's book. This will be my side pattern, and I still have yet to choose the pattern for the center panel of pickup. We'll see what tomorrow brings. Bamboo reed in progress in the dorm room at UVic. 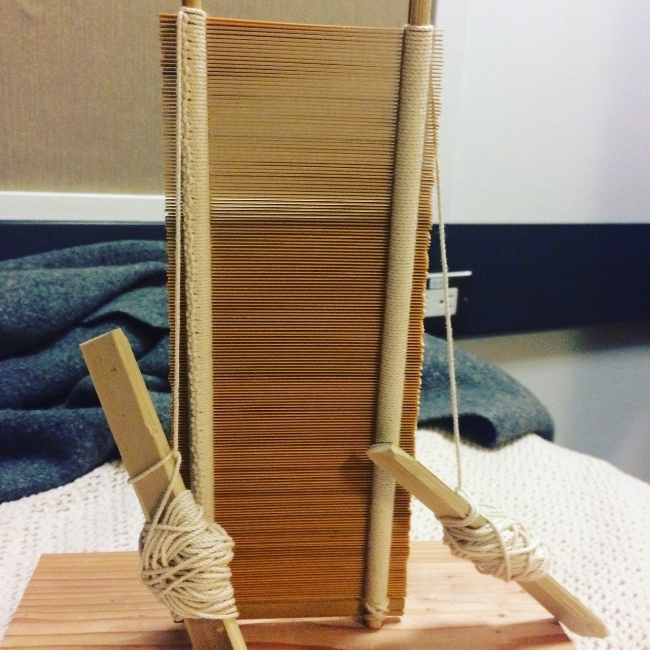 I left the reed half-constructed in the previous post, but it was finished within the three-day workshop, I love how it looks like something maritime while on the stand, with its twin masts and hanging bobbins. There was a scary moment when Bryan discovered a problem with the width, but he corrected it with some selective pounding. Soon enough I had a finished reed! Don't try this at home. Bryan hammers the bobbin against the bound string to correct a widening problem. Then he showed us how to measure to make sure this doesn't happen. Bryan double checks and admires the work of an early finisher, before taking the reed off the stand. My reed, finished and awaiting shoji paper along the edges. When I got home I immediately cleared the deck to weave with it, rummaging in my weaving yarn bin to find the right warp. I chose an undyed cottolin a friend had given me, and found some handspun for weft. Eager weaver, trying out the new reed. I wound a long warp, more than 3 meters. When I first tied on, I had to open the door behind me in the photo, and sit in the closet. Some astute observers may be thinking that those two balls don't look like much weft, and that is correct. I was so eager to get started, I didn't even think of measuring for weft, and they were already wound in balls without recorded yardage anyway (I had the idea I would ply them with something else eventually), so I plunged in with about three bobbins' worth of weft. Needless to say, I had to spin more as I went along. But I was weaving! With my handmade reed! Longer, finer, and wider than most of my backstrap weaving so far. Somehow the fabric felt Japanese. The width is similar to kimono cloth, but the use of this tool seemed to put the whole project into a certain cultural mode. I always like the state of mind I have while weaving, but this time it was even more transformative. Bryan had talked about the Japanese aesthetic and the deep roots of the mindset, and I felt tapped in to the sense of making "egoless cloth" with this piece. The end result feels Japanese to me, too, in an intangible way. I'm grateful to Bryan for helping me access this way of weaving. Although I spent three years in Japan, I was not able to engage with textile making in that context, so it has been elusive for me. Meanwhile, I went to work on another, smaller reed. We had enough supplies to make a second reed of 8 inches or so. I set this up and tied it slowly, relishing the process. I very much like doing the work of making this tool. I carved the nearer pair of binding rods myself - they're rough but they worked. The second one ended up with about the same dent (22 epi), wide enough for 8 inches of weaving. I hope to to some sakiori with this one, using my stash of kimono silks as weft. Work in progress. Handspun wool two ply warp, singles weft. Handwoven cloth from Oaxaca with shellfish-dyed yarn, Maiwa Loft, Vancouver BC. Sarah Swett Rough Copy series detail, at La Conner Quilt & Fiber Art Museum, La Conner, WA. I mean 'overwhelmed' in the best possible way. I've been trying to mentally catch up with everything I've experienced in the last week or so, and I don't know if it's even possible. Textile inspiration coming on strong, combined with nice weather and plenty of natural beauty.... I mean, is this for real? All of these photos were taken in the last 8 days, so I'm feeling very rich. And insufficient. But I'll try to at least share some of the bounty here. Last Monday was the Maiwa Loft. My weaving guild had a special behind-the-scenes visit with Charlotte Kwon, who gave us hours of her time and enthusiasm amidst the boundless wonder of the Maiwa collection. As the table filled with layers of textiles, we heard decades' worth of stories from India. Contemporary Rabari head shawls, spun, woven, dyed, and embroidered by artisans from multiple tribal groups, in a traditional style. Ikat silk saris from Orissa, dyed with indigo and pomegranate. Every piece we saw is of the most exquisite quality, the pinnacle of multiple skills, each more mind-bending than the last. Charlotte has made a life's work of seeking out and promoting the best textile skills, in their traditional family context. Maiwa supports artisans in keeping their skill and knowledge honed and growing, not designing and ordering so much as commissioning the weavers and dyers to do what they do best. The magnificence of the work uplifts the makers, the viewers, and the market in general. There is so much optimism here! Charlotte Kwon in the Maiwa Loft, talking textiles. Handspun jamdani cotton from Bengal. If you wanted to know the meaning of the word "diaphanous", it is this cloth. And then there was the Sarah Swett opening, at the La Conner Quilt and Textile (or Fiber Art) Museum. I'd been paying close attention to Sarah's recent work because she's doing this, and posting pictures like this. Backstrap loom. Plainweave. Be still my heart. Detail of Rough Copy #8. Every letter is woven in. Rough Copy #9, near the window. Just to absorb the impact of typewritten text on scraps of paper as door-sized woven tapestries was mind-boggling. But then Sarah was also there, crackling with energy, explaining details in a guileless manner. I could listen to her all night. Sarah talks us through weaving typeface, from the bottom of Rough Copy #13. Other pieces showed the breadth of her work, reaching back into her archive of color and story. Being able to touch this book was a great experience - so supple and wooly! Detail from the woven book Casting Off. All the tapestries are double sided, so the back mirrors the front as you turn the pages. I may have to go back and visit the show, alone and quiet, so I can spend some more time looking up close. I definitely need more time to get my mind around all this wonder. Exquisite detail from Rough Copy #6. It's a postcard, with cancelled stamps. Only four feet tall. Work in progress with my backstrap - handspun cotton. I just spent the better part of an hour winding two balls of yarn. Particularly gratifying in this case because I went to Luang Prabang's Phusi market on my own, completely forgetting to arm myself with a sample of what I needed, and yet ultimately succeeded in buying black yarn. I wandered agog through warrens of clothing and shoes and plastic goods fruitlessly for some time, trying to squint into the tarp-covered distance to discern anything yarn-like or weaving related. Finally I stopped at a booth carrying elaborate, gilded skirt borders because she had thread, which is close. I gestured at the thread and said that I weave and needed this... big, weave.... Then I showed a photo of Mone warping with the balls of yarn on the floor. She pointed me in the right direction, and I eventually came upon the shelves of yarn. Soon after, Iwas happily winding balls back at the guest house, to the sound of neighboring roosters and the distinctive, musical ringing of the Lao mortar and pestle, wood against clay pounding papayas or chili paste. Whenever I wind balls of yarn, I can't help drifting into philosophical musing about it. It's one of the things I do differently from most of my weaving/knitting peers in the US (who tend to use a ball winder and swift), but in a similar way to traditional weavers around the world. Weavers spend an awful lot of time winding balls of yarn, especially if we also spin the yarn, and ply from two-stranded balls. Handspun wool, wound into balls after plying. Handspun wool in Doha, Qatar. The distinctive shape of the red ball shows how it was wound onto the spindle shaft after plying. I learned my affinity for global, traditional ball-winding on my first visit to Luang Prabang, when I met my Katu backstrap weaving mentors, Keo and Mone. I'd been hanging out watching Keo weave, and when I started to wind some cotton I bought into balls, she offered to help. When Mone arrived and was able to translate between us, Keo told her "Look, she winds balls like we do." I was surprised and happy to hear it - I'd known that weavers in Ladakh, Arabia, and Peru used balls wound in courses, and that was more or less what I tended to do, but had no idea it would be identified as a recognizable style, especially since I wasn't that good at it. Handspun wool in Ladakh, India, wound into two-ply balls in courses, ready for plying. My handspun singles, wound in a ball to free a bobbin, and awaiting a second ply. It seems appropriate that the first time I met another weaving mentor, Laverne, we immediately set to winding balls together. I could see that she was preparing a number of little yarn balls, and I offered to help. As we wound, she pointed out that it is really a learned skill, and one can't count on people knowing how to do it, even if they knit or weave. She advised teaching it as part of a course in spinning or weaving. I see it as a very basic fiber skill, but obviously part of the knowledge necessary to be an independent weaver, not relying on an array of complex tools apart from one's body to manage yarn. There is a technique to starting a yarn ball from scratch - I noticed that even Mone preferred to wind onto a ball already in progress, since starting from the beginning is fiddly. 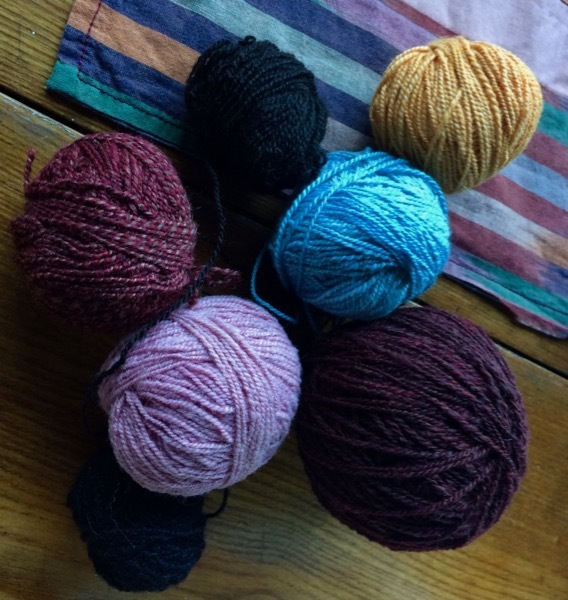 My favorite ball of yarn, though, has to be the tiny one found at a recently excavated Bronze Age site in the UK known as Must Farm. Seeing this ball of (probably) linen, wound in courses some 3,000 years ago, adds another dimension to the sense of ball winding as part of global textile tradition. So this weaving. I decided to try weaving from the other end, just because I wanted to experience that. Normally this is done to achieve four selvedges, but since I didn't have a nice selvedge at the beginning, it wouldn't matter for this piece. I simply did it to see how it's done, sacrificing a few inches that I might have added to the length of the piece - because I knew I wouldn't be able to close this gap completely, even with plain weave. The sheds are too difficult to open, and I reached the limit of my sword size at this point. I had predicted that I would not get closer than 3 inches, and this shows I was right. Now I have to face cutting it, unless I plan to display it forever like this. Then a bath, and then finishing. Still unsure what this will look like, finally, but it will most likely be what it is - a piece of weaving: flat, rectangular, as long and as wide as it is. 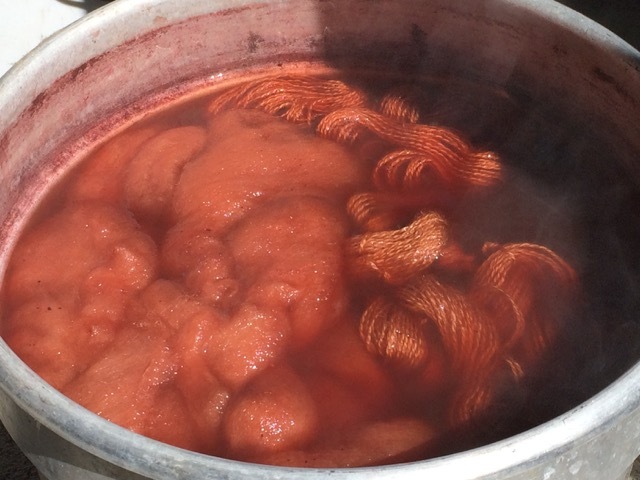 Then there was a natural dye workshop. It's hard for me to resist this kind of thing, especially when it features the expertise of someone like Emily of Local Color Fiber Studio in Bainbridge. 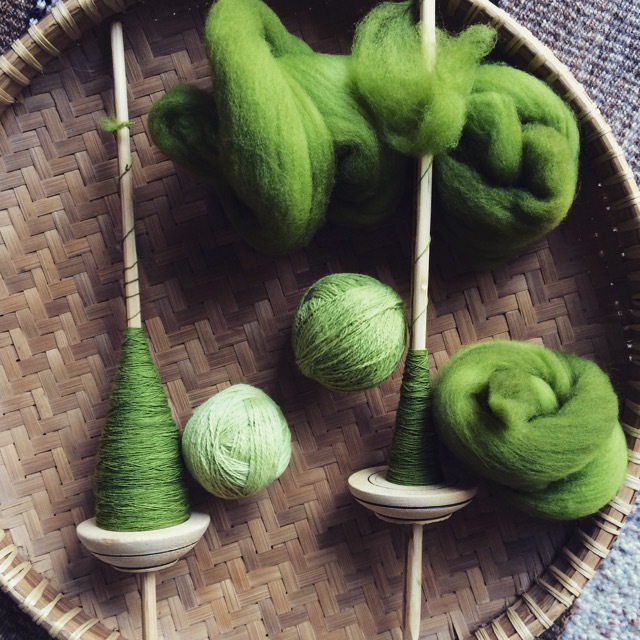 I've done natural dye classes before, and they're always a little chaotic, but they produce beautiful images, beautifully dyed yarns, and give me a nudge toward doing more of this myself. The pot above is made from grapes, gleaned from a vineyard where Emily works part time. They're especially dye-friendly grapes, and they made a beautiful lilac shade on the mohair yarn we were using. Another attraction of the class: spending a beautiful day by the water in Port Townsend. Just watching the yarns come out of each dyebath and hang in the sunshine was pure sensory delight. I took some fiber to dye, and came home with nice colors - they will look good as stripes in another backstrap weaving, along with the green Targhee I've been spinning during the Tour. I'm currently working on a piece that is all handspun wool, and relatively large for a backstrap weaving. It's traveled around with me, and I've given demonstrations to weavers, friends and students in Seattle and Kansas City. I don't have many good photos of it, but I'm honored to say that Laverne posted some here. As I've been working on it, this weaving has become a kind of home base for me - an experience I haven't had before with weaving. At home, I check in with it almost daily, putting in a few rows in the early morning. Already, before taking it elsewhere, the weaving felt like a space, a separate place to go for a while. When I'm there, I'm in the weaving, in the world of it, which has certain rules that I needed to learn when I began. How to manipulate these yarns, and open these sheds, slightly different from any other project I've done. The pickup is a different set of patterns - so although the technical process of pickup is familiar, I had to learn to read them. The first time I demonstrated, I remained silent, and was able to weave along, without mistakes, for several picks. 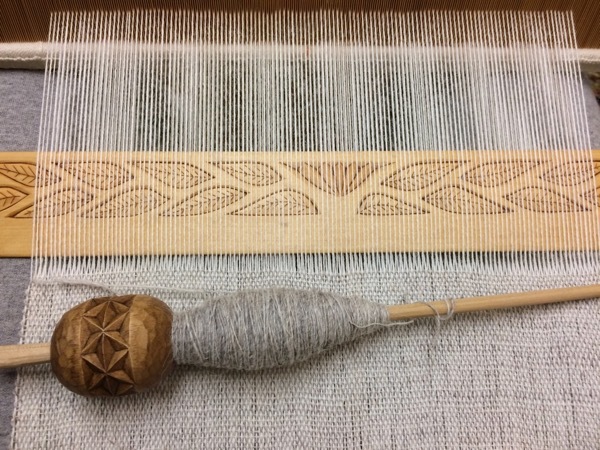 The second time, I was trying to explain the process to students, and I couldn't fathom my pickup, then forgot to pass the weft (which, by the way, is a good way out if you have made pattern mistakes during a demo - just don't pass the weft!) I learned that people just want to see you change sheds a few times, so "pretend weaving" is good enough for a warm-up. After a few minutes, I got to the point where I could weave for real and answer questions. These experiences made me bond more with the weaving, in a way. I had to master its language enough to do it while semi-distracted. 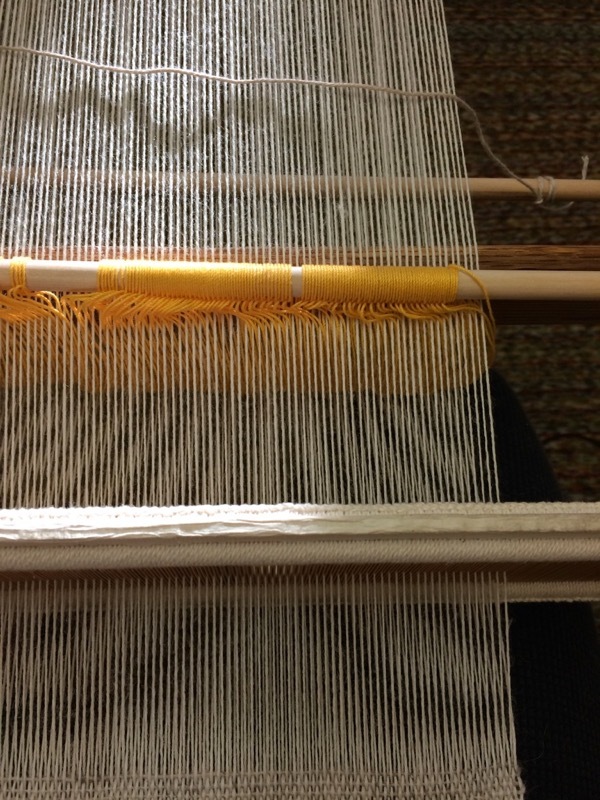 Not arguing for multi-tasking, but it's interesting how the distraction made me focus more, and go a bit deeper into my relationship with my weaving. Which is what I'm trying to talk about. 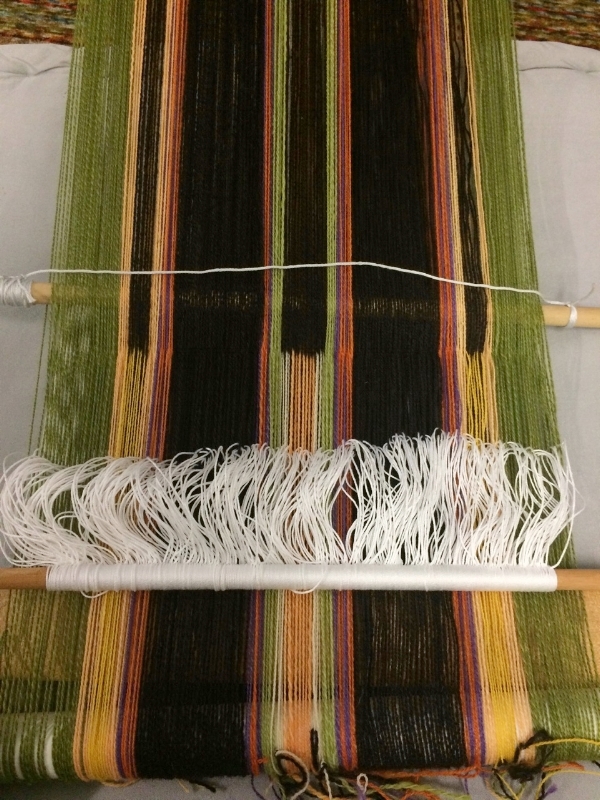 There's a relationship with this weaving, as a process and as a piece. My time with it is valuable, and necessary. Like feeding a friendship, the time weaving solidifies something good in my mind, something deep and true. So when people ask what I'm planning to do with it, I have no reply because I'm not thinking of it that way. Not trying to get something done, but just doing. Something important.